Cody telling Todd she loves him and them kissing. Todd and Cody continue to kiss but Cody pulls away, she says it's wrong but Todd says he feels the same way, both of them know that Josh and Melissa will be angry. They decide to tell them separately, Todd will tell Melissa, Cody will tell Josh, they hug. Josh is sat alone looking pensive, Madge comes in after shopping for food. Madge says she is too busy now and no-one leaves her alone now she is a councilor. Eddie has gone to the races, Madge isn't happy with him wasting his money when he should be looking for somewhere else to live as Gemma (Madge's niece) is arriving soon. Harold promises to talk to him. Kerry has been shopping for relaxation and meditation things; Joe isn't happy with the money being spent and says beer is his relaxation method! Cody comes in to speak to Josh, Cody says him and Todd talked, Josh presumes that she is here to get back together with him. Josh continues but Cody gets angry and walks out, Josh is confused. Todd and Melissa are looking at Jim's records; Todd is staying there while Beverly is away. Todd starts to talk about Josh and Cody. Melissa thinks they will get back together, Todd doesn't say much. Melissa apologises for lying about the ban again and they kiss. Sharon is on the phone to Bronwyn, she hangs up as Harold enters. Sharon asks Harold if he minds having lots of people staying, Harold says he doesn't mind but says on occasion he wants the house to himself. He then says Sharon can stay as long as he wants. 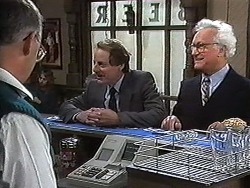 Madge is serving three customers, they are having a go at the Council, and Madge tries to defend them. 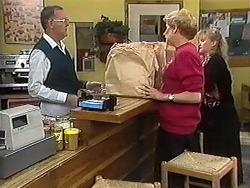 The customers are saying that Madge is only on the Council for personal gain. Josh bumps into Melissa, she says that Todd is in a funny mood so Josh shouldn't see him; they decide to go to his house. Kerry is relaxing with incense and music, Joe isn't enjoying it while reading the paper, Kerry coerces into him joining her. Joe sits on the floor and Kerry tries to get him to relax. Toby is laughing at him but as Sharon enters Joe becomes embarrassed! Harold arrives to see Madge; she is tired and wants to go home. Two councilors arrive and introduce themselves to Harold. Madge thinks they were looking down at her, Harold disagrees but Madge is riled. Todd and Cody are trying to work out how they can tell Melissa and Josh the truth. They are worried about losing them as friends but they think it's inevitable, they also decide to go trail bike riding tomorrow. Kerry is saying Joe enjoyed the relaxation technique before and it was only Sharon's arrival that stopped it. Kerry says Joe is always stressed and uptight. He says he will try new things, Toby and Kerry disagree. To prove them wrong Joe agrees to try Kerry's relaxation technique next week. For some reason they are all sitting on patio furniture. Madge says she is too busy to go out for dinner sometime with Harold, he thinks Madge should stop working at The Waterhole, Madge does not like this idea. Sharon announces she is moving to New Zealand to be with Bronwyn, she is lonely over there as Henry is always busy. Sharon says she can transfer schools, Madge and Harold says they will miss her. Cody and Todd say it's been too difficult to tell Melissa and Josh. Melissa comes in and Cody makes a hasty exit bumping into Josh on the way out, Cody leaves. Melissa thinks her and Todd should try and get them back together, Todd looks worried.